Typepad has this cool new interface. They've got these cool new "widgets". Supposed to be practically self-installing they're so easy! BS!! I've just spent the last hour trying to install a little search widget. Code and everything is right - no button on the blog. I have no clue why not. I have also unsuccessfully followed the easy directions for putting up my Blogroll. My plan was to eliminate the long list of links on the sidebar and replace it with my Bloglines Blogroll. I cannot keep up with adding the links, but adding to Bloglines is a snap. Yeah. Can't get that to work either. Before they say something is idiot proof, and so easy you can do it in seconds, they should get me to test it! My young friend John is now vacationing with family in Ankara, Turkey. I hope he's having an amazing time! I promised him a surprise for the next time he looks at the blog. You get the surprise too. Dear Hubby and I have been married for 16 years. We dated for 5 years before that so we've been tangled up together now for 21 years. That seemed like a pretty major milestone to me and I wanted to do something significant to acknowledge it. We both come from a Celtic background. His is Irish / English; mine is Scots / French. Something Celtic seemed appropriate. Something we could both have. Something to remind us of the "ties that bind" and the joy we take in each other well into our old age. 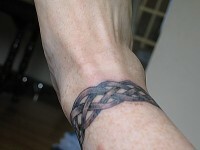 Design by Pat Fish, Lucky Fish Tattoo. Yes. It Hurt. A Lot. Yes. I brought knitting with me. 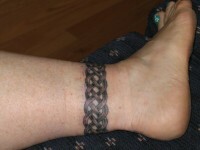 No, I couldn't knit while getting tattoo'd. First, the motion of my hands made my ankle bounce slightly and Ben said no knitting. Second, I really needed to focus on breathing steadily and keeping still. Much like childbirth actually. For the record, the birth of #3 did hurt more than getting a tattoo. Ironically, both took about 3 hours. 1. Cece continues to languish in the basket, in pieces, until I have several hours to devote to the marking and attaching of her sleeves. I will do this once more. After that - it's a stocking stitch yoke! The back of this cute little shell, which purports to be a 3 day knit. Actually, it probably would be if you didn't pass out from the sheer boredom of stocking stitch. If it weren't for the thrill of slipping those 2 markers and the bonus of an increase or decrease every 6th row Sizzle would Fizzle. 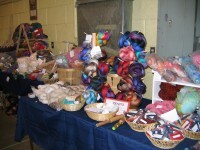 Maybe it's because I went stash diving and the only worsted weight cotton I had was TLC Cotton Plus. I like the colour, and the hand is ok, but I think the acrylic content will make it hot. On the left is the world's (at least in my world) fastest sock. That is a man sock in Online Somethingorother. I love the colourway though, and the varied blues. I love the way that the widest band of faux fair isle lined up perfectly in the short row heel. I love the way that when you fold this sock in half, the bands line up perfectly. 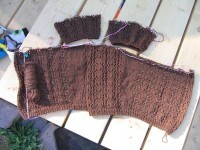 The pair is a gift due Aug. 5 - good thing I am easily entertained by self patterning yarn! On the right is the world's slowest sock. 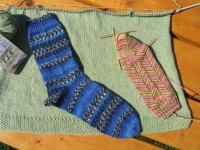 That is the second Jaywalker sock in Artyarns - the Crabapple tree socks. I have just turned the heel and picked up the stitches from the flap. Foot should go faster because only the top is patterned. And for your summer viewing pleasure....my toes, featuring my new pedicure. She painted the flowers with a toothpick. Love It! Honestly people, how is it that I can be on summer holidays and busier than when I'm at work? There is a problem here. Here are #3 and #2 getting ready to ride. Rides are expensive, so we limited them to 4 each. These two liked this spinning swing so much they went twice! Actor Buffalo. 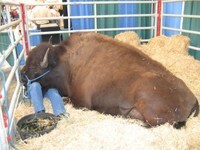 This is the Buffalo you see on tv in the commercials. He's HUGE!! but apparently very tame. One of his owners is a lady who is - you guessed it - a knitter. She combs the big guy for his down and has it blended with 20% merino and spun at Custom Woolen Mills. Then she keeps it all for herself. Can't say I blame her. #2 couldn't get enough of these downy chicks. So soft! 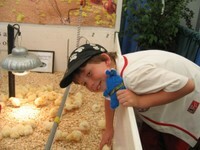 Every time I lost him, I found him with these chicks. #3 found a horse just her size! 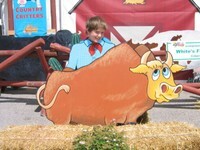 Here's #1 chatting with a bull. Please note: I have since shaved his head! That mop of hair had to go. What a pretty little alpaca. 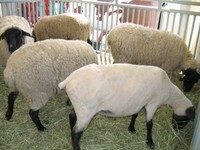 This one was shorn in a demonstration earlier in the day. There were sheep too! 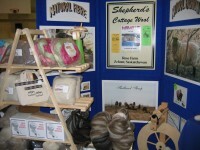 I was quite disappointed not to be able to see the shearing demonstrations that day. The little sheep in front their looked so smooth, soft, cool, and comfortable compared to her pen-mates. 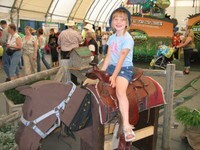 Not Stampede without a horse. This is DAN. 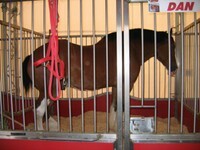 He's one of the Budweiser Clydesdales. This is a 12-horse hitch that regularly appears and wins prizes in the Stampede Parade. These horses are enormous. Those pens are 10 feet tall! I think they are gorgeous animals. 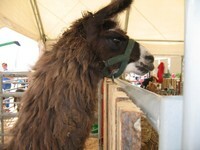 One more llama shot. Please ignore my flat hair day. 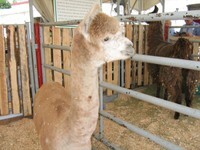 This Llama Ranch raises the animals for meat rather than fiber. 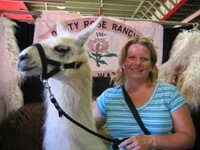 The owner was explaining that because of this her llamas tend to have much more guard hair than llamas bread for fiber. She does have the skins processed into rugs though. Picture taken by #1. I've been going to the Stampede my whole life and this is the FIRST TIME I have ever even seen fiber for sale, let alone bought some. 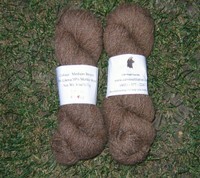 This is just 2 skeins of heavy worsted/bulky weight llama/merino. $4 each! I couldn't resist. They'll make lovely warm winter hats or mittens, or maybe both. More knitting news soon! I really have been knitting quite a bit. There's this fabulous pattern. It's well written, clear, and really doesn't appear that difficult. 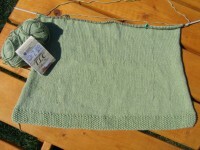 I expected a quick 2 week knit and presto summer cardi. NOT!!! I knit the body - no problem. I knit the sleeves - no problem. I CANNOT connect the sleeves to the body and maintain the lace pattern. Look. Click on pics for full size. Can you see how the pattern is off? I swear, I counted and recounted and compared and double checked. Does this part look right? So this is what I did. I have taken Cece apart - again. This time, I've installed a lifeline. I may not be skilled but I am smart enough by the third try to do that much anyway. Next, I am going to count and mark every repeat of the pattern all the way across the body. Then I'm going to do the same thing with both sleeves. 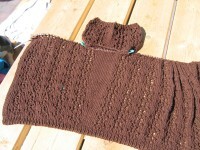 Then, I will try one more time to install the sleeves and knit across them with the pattern intact. If it doesn't work, I'm calling Bonne Marie and shipping the damn thing to her in Chicago! Knitter waiting with sock. An older couple (70's?) come in with their daughter and sit nearby. I smile, because I'm Canadian and we smile at strangers, it's polite. They watch me for a while, nodding at each other and commenting quietly. Then the lady asks what it is I am making. "A sock", I explain, and pull out the completed crabapple tree jaywalker for them to look at. They examined it closely - it's really a pretty sock - admiring the colours and the zig-zag pattern, disbelieving that something so soft could be wool. We chatted a bit while I knit on. The lady had had a mastectomy many years ago and was now suffering from the side effect of lymphedema (that extreme swelling of the arm on the mastectomy side which resulted from removal of much of the lymphatic system as part of a radical mastectomy). I wished I had a titbit with me to give to her. They shared that she loves her garden, but the pain in her arm makes it hard to do much work. He was such a happy man, obviously still very loving and caring about his wife of many, many years. It was he who shared that she used to knit with one hook. I smiled and asked her why she had stopped. She shrugged her shoulders and looked at the swollen arm as if to say, "With this thing, how could I?" "But you can," I said, "and you should. It's good for you to use that arm. It won't get any better by babying it. Use it, stop if it starts to feel sore or stiff or uncomfortable. Maybe you can only crochet for 5 minutes? So what? 5 minutes here and there makes socks for me. It could be a washcloth for you." 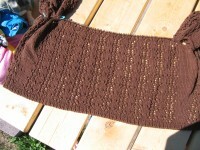 She smiled and nodded, saying she had a partially finished sweater she had been knitting. Shyly, she asked to have a closer look at the sock on my needles. He moved over so that I could sit between them. (I think he wanted a better look too!) Slowly I showed her the knit stitch, explaining the pattern that creates the zig-zags. From the corner of my eye I saw her fingers unconciously rubbing together as if feeling that strand of yarn. "Here," I said, "you try!" She hesitated, "I can't hold it like you." I mentally smacked myself in the head - of course she can't - I knit the English style, throwing the yarn with my right hand. This couple were immigrants from Hungary - she would knit Continental, picking the yarn from her left hand. Immediately I switched hands and did a few stitches that way. Her eyes lit up in recognition and her hands reached for the work. It was a lovely moment. Behind the desk nurses and clerks nudged each other, smiling broadly. Her hands remembered what to do and in no time, she had finished the needle. How to continue? I showed her how to move to the next needle and told her just to knit every stitch. When I was called into the exam room she had almost finished a round. "Just keep going," I said, "leave it on the table if you have to leave before I come back." I was rewarded with another happy smile and her fingers flicked easily through the stitches. They were still there when I returned, but the smile had been replaced with a worried look. It didn't look the same, the raised stitches were missing, she had ruined my sock. "Not at all! It's only string, and the sock doesn't mind" I showed her how easy it would be for me to correct the look. He took me aside as I stood to go, gently asking where could he take her that she could knit. I named a store that I know will be warm and welcoming. Returning to gather my paperwork, I felt a hand settle softly on my arm. With shining eyes this lovely lady asked my name and thanked me for my time. She said more lovely things, which I shall hold in my heart, but they make tears spring to my eyes as I recall them. Such a small thing. Such an insignificant thing. Her gratitude was so genuine I felt quite overwhelmed. I had done nothing more than spend a few minutes helping someone to remember a craft, rekindle a spark, find light and hope in spite of age and infirmity. Blessings to you Elizabeth, and to you Joe. May you both continue to enjoy your love. I am very fortunate to have met you. I'm very glad that I started writing this blog. At first it was a bit of a lark and I wondered if anyone would ever read it. Then I discovered that I very much enjoyed writing and sharing. Gradually people like you started to read - how you found me I'm not sure but I'm very grateful that you did. In celebration of my First Blogiversary, and Canada Day, I dragged to family to Olds, Alberta and a visit to Fibre Week at Olds College. The very first person I spoke to was this lovely and talented lady. She was sitting under a canopy peacefully spinning some lovely fine singles in the shade. I am so sorry that I didn't get her name. A bit later on she very generously showed my kids how to spin using a medieval drop spindle. Anyone who is interested in those really old ways of making fabric by hand might be interested in a University of Calgary Continuing Education Department class this fall. Medieval Textile Technology: From Fleece to Fabric is being offered by the U of C this fall. 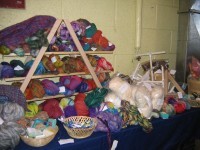 It sounds like a great class for anyone who enjoys working with fibre. My first priority for the day was to acquire a drop spindle. I am taking the hand-spinning course at Make 1 Yarns later this month but I just couldn't wait. The other tents hold the answer. 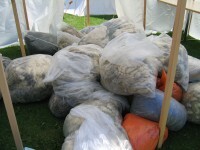 Bags and Bags of fresh fleece. Note to self: unwashed fleece wrapped in plastic and set out to bake produces an aroma redolent of pasture, and the sheep therein. 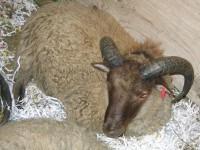 The owner of these fleeces was in a make-me-a-deal mood. If you have the know-how and the space to process them, you might be able to walk away with the legendary three bags full! Ahhhhh - the motherlode! 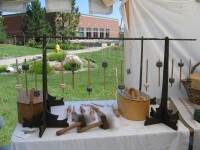 Handmade soapstone drop spindles with oak shafts. Beautiful! A five minute lesson by their maker, and I was hooked. My choice was a top whorl with a groove detail that felt perfect in my hand. New spindle in hand, I needed fiber to spin with. 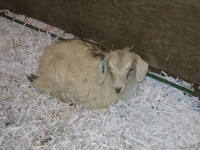 I chose this 100% Cotswold Lamb roving. The helpful and informative ladies explained to me that Cotswold is good to learn with because it has a long staple length so makes drafting a bit easier. 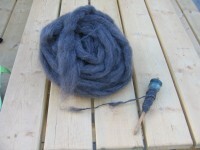 That's my spindle and my first tries at spinning. 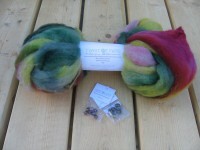 Lovely, soft, dyed and painted roving in wool, alpaca/silk, and pure alpaca. Also handspun yarns. 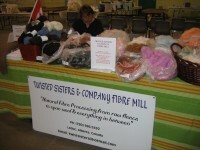 Check out Twisted Sisters & Company Fibre Mill in Rollyview, Alberta. 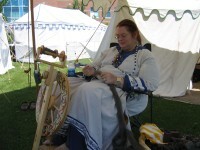 Delicious fiber, bags, and an Ashford wheel that had my husband giving me nervous glances! What's a fiber festival without the source of fiber? 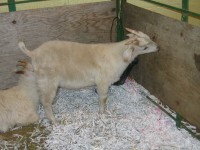 What a cute little angora goat. Sorry, no idea what breed. 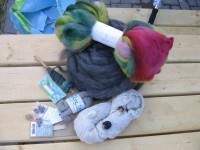 All of this comes from the talented hands of fibre artist Erynn Carney of Twist of Fate. Truly stunning, gorgeous vibrant colours. Irresistible. 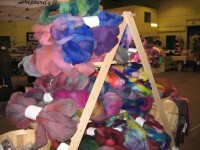 Another wonderful booth that kept pulling me back (silk hankies, silk roving, bamboo top, merino top) was Legacy Studio. I was to busy feeling everything to take a picture but I will be making a tiny trip out to Cochrane, Alberta for a visit to the store. 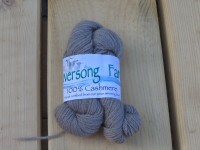 The latest addition to the exotic stash is this little skein of undyed 100% Cashmere from Riversong Farms in Nazko, BC. Their business card says, "B&B Farmstay with Private Cabin" Sounds like a fantastic holiday to me! 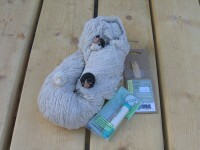 This bit came from Pam's Woolly Shoppe in Stony Plain, AB. A beautiful, long skein of laceweight tussah silk, a chibi (yay! ), and a set of Brittany Birch 3mm dpns. I couldn't resist the wee sheep! Most of this will become part of my Knit Socks Kit Swap package. I did search for the perfect colour of sock yarn for my partner, but alas, it was not there. The tower of roving called to me.....this bundle of hand dyed Romney roving and two sets of handmade stitch markers. One set also for the sock kit. Here's the whole lot altogether. Happy Blogiversary to Me!